Importantly, the findings can inform the design of small-molecule drugs tailored to the unique structural features of the human protein–an advance that promises to boost the precision cGAS-modulating drugs that are currently in development as cancer therapies. The team's findings explain a unique feature of the human protein–its capacity to be highly selective in detecting certain types of DNA and its propensity to get activated far more sparingly, compared with the cGAS protein in other animals. In all mammals, cGAS works by detecting DNA that's in the wrong place. Under normal conditions, DNA is tightly packed and protected in the cell's nucleus–the cellular "safe"–where genetic information is stored. DNA has no business roaming freely around the cell. When DNA fragments do end up outside the nucleus and in the cell's cytosol, the liquid that encases the cell's organelles, it's usually a sign that something ominous is afoot, such as damage coming from within the cell or foreign DNA from viruses or bacteria that has made its way into the cell. 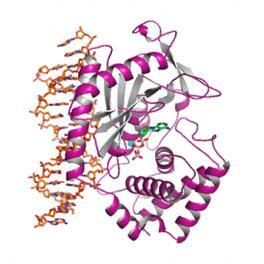 The cGAS protein works by recognizing such misplaced DNA. Normally, it lies dormant in cells. But as soon as it senses the presence of DNA outside the nucleus, cGAS springs into action. It makes another chemical–a second messenger–called cGAMP, thus setting in motion a molecular chain reaction that alerts the cell to the abnormal presence of DNA. At the end of this signaling reaction, the cell either gets repaired or, if damaged beyond repair, it self-destructs. For their work, the team turned to an unlikely collaborator–Vibrio cholerae, the bacterium that causes cholera, one of humankind's oldest scourges. Other investigators included Carina de Oliveira Mann, Benjamin Morehouse, Rados?aw Nowak, Eric Fischer, and Nathanael Gray. The work was supported by the Claudia Adams Barr Program for Innovative Cancer Research, by the Richard and Susan Smith Family Foundation, by the Charles H. Hood Foundation, by a Cancer Research Institute CLIP Grant, by the National Institute of Allergy and Infectious Diseases grant AI-01845, by National Cancer Institute grant R01CA214608, by the Jane Coffin Childs Memorial Fund for Medical Research, by a Cancer Research Institute Eugene V. Weissman Fellow award, and by a National Institutes of Health T32 grant 5T32CA207021-02. Relevant Disclosures: The Dana-Farber Cancer Institute and Harvard Medical School have patents pending for human cGAS technologies, on which the authors are inventors.